My husband is not a fan of spinach however this recipe has surely converted him, I’m not saying it might have the same effect on you, if it does then please don’t forget to let me know. This recipe serves 2 adults and as an accompaniment to a main meal, on the side. Start by chopping off the roots of the spinach and discard, then rinse well (2-3 times) in cold water. Drain well and then chop (leaves and stalk together) as small as you can, don’t have to chop too fine. Grate ginger and finely chop garlic and onion. Then to a utensil on medium heat, add oil, once hot add asafoetida, dried red chillies, black pepper, cumin seeds, mustard, curry leaves, urad dal and saute till they release aroma, approx. 30 seconds or so. Then add in ginger, garlic and red onion. saute till the onion is translucent. sprinkle a tiny bit of salt this will help draw out the moisture from the onions and cook faster. This may take about 3-4 min. Now add the chopped spinach, sprinkle another tiny bit of salt, this will help wilt it down. Don’t mix. Turn the heat to low, close lid and cook for 5 minutes. Open lid, add turmeric, red chilli powder, cumin powder & coriander seed powder. Mix well. Check if it’s seasoned well, if not, sprinkle a little more salt and cook for another 5 mins and turn heat off. Serve as a side with some hot rice and sambar or dal, Enjoy! 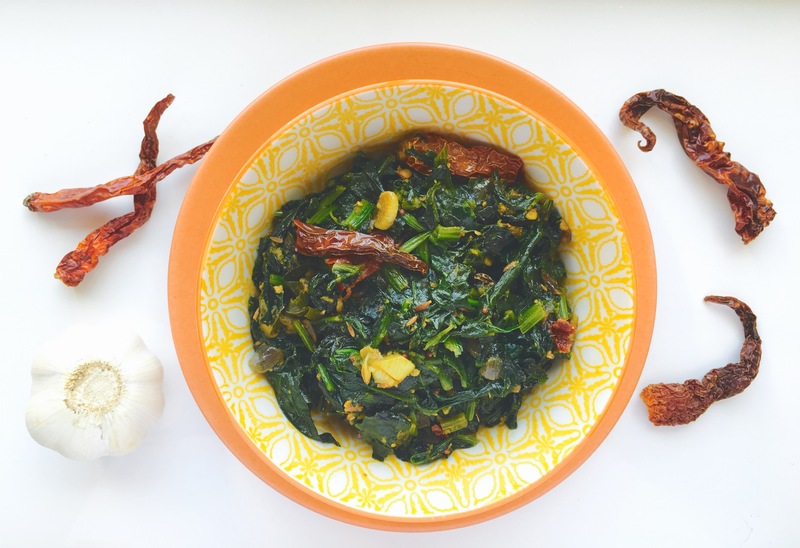 Tip: The big leaf spinach works best in this recipe as it has more flavour. I think sesame seed oil works best with spinach recipes, as they really compliment each other.